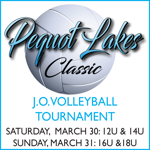 athletics and activities at Pequot Lakes Schools! If you are interested in sponsoring our next order of bleacher chairs, please contact Melissa Chaney at 619-987-4500 or jayandmelissa@charter.net. The cost is $300 for your business name or logo to be printed on 50 chairs. There are only 6 spots available, so respond soon if you are interested. A big thank you to Robert Engholm in helping make the portable bleachers a reality! Link to school's website calendar. 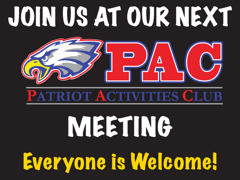 ©2019 Patriot Activities Club PAC / SportsEngine. All Rights Reserved.